Putin’s exclusion  exemplifies the perversion of policy and history attendant on the Nazi ascension to power in Ukraine. 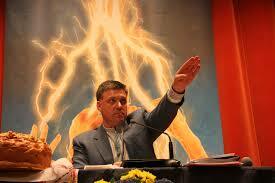 Yatsenyuk is an important part of the renascent National Socialist government now ruling Ukraine. As discussed by George Eliason, declassified U.S. FOIA documents  confirm that the OUN/B and the closely-allied Anti-Bolshevik Bloc of Nations constituted an OUN/B National Socialist government-in-exile. The Maidan coup of 2014–itself a well-documented covert operation–brought that government to power. We present a courageously accurate op-ed piece by Chris Martenson in the mainstream Market Watc h  blog that correctly notes that the West (and the United States in particular) are waging war against Russia. Part and parcel to that is an organized NATO effort  to propagandize on behalf of the pro-Nazi government in Ukraine and its Western-supported policies. One wonders if this will ultimately entail efforts against those hardy few in the West willing to swim against the daunting current of Serpent’s Walk-style propaganda. Among the events being effectively neutralized in mainstream media coverage of the Ukraine crisis is the deliberate cut-off  of badly-needed entitlements to elderly residents  of Eastern Ukraine. This is a war crime  that endangers the lives of hundreds of thousands! Program Highlights Include: The use of relativistic language  by Western media, characterizing documented historical fact as “Russian” or “Kremlin” propaganda; review of the rejection by the EU, the U.S., Canada and Ukraine of a resolution introduced  in the U.N. General Assembly that condemns the celebration of Nazi collaborators; the subtle, revisionist pro-Nazi  rhetoric of German president Joachim Gauck; the probability that a Westerner –possibly an American–will head the Ukraine’s “anti-corruption” bureau . See A Broad-Based Anti-Russian Alliance , Termin beim Botschafter  and Juschtschenkos Mythen . See Zwischen Moskau und Berlin (IV) . See Tag der Kollaborateure  and “Liberation Fighters” and “Occupier” . See Ein positives Ungarn-Bild . The recent expansion into Britain of Moscow’s international news channel RT,  or Russia Today, has prompted a series of national security discussions at some of the highest levels in the British government, say officials. Yet policy makers are at a loss when it comes of proposals to deal with the threat they perceive, particularly when no laws have been broken.